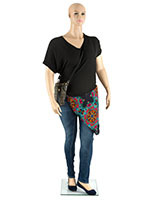 Are you searching for realistic mannequins to use in your store or window displays? If so, we have a huge selection of full-body fixtures available. 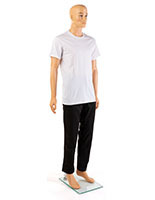 Realistic mannequins are the ideal way to present clothing to potential customers as they are able to see what the garments look like on the human body without having to try them on. We offer a line of female and male adult, child and toddler sizes as well as a plus-sized form for ladies’ clothing and seated models to meet all your display needs! The realistic forms are designed to look as human as possible. The fiberglass and tempered glass construction is fairly lightweight and easily portable but also has the look of real skin. 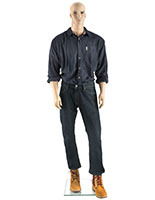 The flesh-tone color of these realistic mannequins, also called life-like clothing displays, makes them appear natural. Please note that we offer a selection of different male and female dummies with varying features. For example, the facial features like eyelashes and eyebrows are painted on to look as life-like as possible. The hair is also textured to look like real hair. 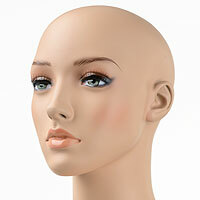 The models that come without hair are perfect for customizing with wigs or other accessories. Choose the model that best meets the needs of your retail location. What are some of the key features of these life-like clothing displays? 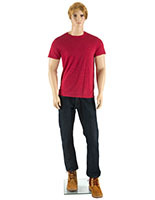 The flesh-tone skin coloring of these realistic mannequins doesn’t detract from the clothing being displayed but instead looks natural to the customer. 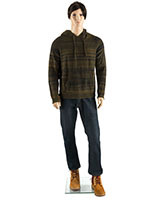 Because the figures look so realistic, customers can see what certain articles of clothing look like on the human form. The faces of both the male and female fixtures are painted with great detail to appear as real as possible. 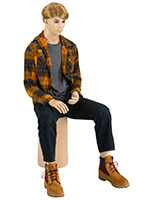 The forms can be arranged in several, life-like scenarios that properly display clothing and accessories but aren’t as distracting as live models or as dull as folded displays. These store fixtures are extremely popular not only because of their life-like forms but also because of the removable parts. The bonus to using these figures is that come apart at the waist, arms, legs and occasionally head and hands is that it allows employees to move them with ease and pack them down to smaller sizes for storage. The fully formed hands and feet can also support a variety of accessories. The natural figures successfully display a wide variety of fashion items and styles without being overly decorative or distracting. 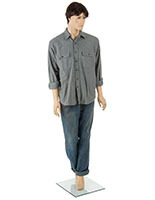 One of the main concerns with having these life-like clothing displays in your store is the stability of each fixture. 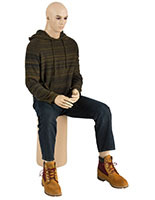 Rest assured with any full-body mannequin we sell! Each is supported by calf rod which is anchored into a metal base. The bases are neutrally colored as to not distract from the overall presentation. 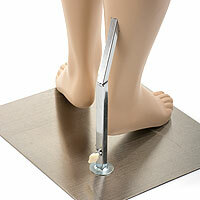 The realistic bust forms can fully rotate on the rod and base to be turned any way you desire. But will always remain stable and secure. 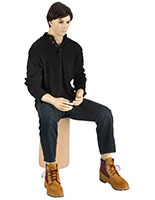 Some of the models we offer are even sitting down. 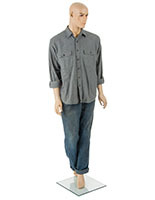 The life-like clothing displays come with the pedestal on which they sit and are just as sturdy as those attached to a base. Where can these store fixtures be used? The most common use for these forms is use in stores and boutiques. 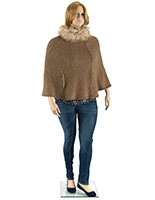 The women’s, men’s, plus-sized and child sizes are perfect for displaying clothing and accessories. The full-body displays attract attention and can create an anotomically correct presentation. The female or male figures can be used for photography purposes as well. Often times when live models aren’t available, they can be used for photo shoots for websites or catalogs. Because of the natural appearance and size of the fixtures, tailors may also make use of them for clothing fitting purposes. The uses for these realistic bust fixtures are ideal for retail settings, tailors, boutiques or shopping plazas. The portability, stability and durability make them the ultimate display item! Because of their life-like construction, they allow customers to easily browse styles and apparel and see what they look like on the human form without having to try things on. This may encourage sales to people who are short on time or who simply don’t want to use the dressing room.